Just over a week after a dreadful 7.8 magnitude earthquake rocked Nepal, displaced families are gradually – but cautiously – resuming their normal lives, though most are still badly shaken by the disaster and the proceeding aftershocks that devastated the country. 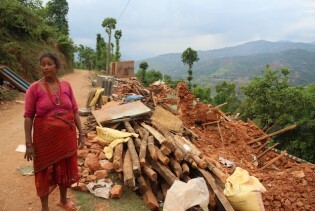 Barely 100 km north of Nepal’s capital, Kathmandu, the settlement of Jure, which forms part of the village of Mankha, has become a tragic example of how the country’s poorest rural communities are the first and worst victims of natural disasters. With over 41 percent of Nepal's three million Dalits living below the poverty line, and over 90 percent classified as 'landless', the country must reassess its progress on the Millennium Development Goals (MDGs) vis-a-vis its most vulnerable populations. Ten years after she was trafficked to an Indian circus, 22-year-old Radha has returned home stateless, with no document to prove she is a Nepali citizen. Her parents are Nepali but she married a fellow Indian circus member, and does not qualify to be a Nepali citizen any more. The 200-kilograms two-seater Zerotracer completely stole the show at Abu Dhabi Sustainability Week. Yours for about 150,000 euros, the vehicle works both as a car and a motorcycle, depending on the mood of the driver, by manually removing or adding two wheels. But that is not the real reason it’s a unique show-stopper. High-tech showcases of renewable energy were not the only key element of the three-day International Renewable Energy Conference in Abu Dhabi – building political commitment towards seriously promoting renewable energy was an equally strong part of the summit, according to Mohammed El Ashry, chairman of Renewable Energy Policy Network for the 21st Century (REN21), during a press conference that concluded the global event. Awareness is growing that the excessive energy currently required to desalinate water is not sustainable in the long term. So the big question is how to make it financially viable and technically possible to deploy cleaner power sources. Arid countries across the globe are finding themselves high and dry, with not enough groundwater to slake the thirst of both food crops and people. But for coastal states, there is an obvious solution, although it is often energy-intensive. Currently classified as one of the world’s Least Developed Countries (LDCs), Nepal has one of the highest malnutrition rates globally, with over 41 percent of children suffering from chronic under-nourishment, particularly in rural areas. Social activists in Nepal agree that the one reason why this impoverished country will miss the gender-linked Millennium Development Goals (MDGs) of the United Nations is the persistence of child marriage. Farmers in this fertile central district of south Nepal are convinced that an intense drought between May and early July that destroyed their maize crops is the result of climate change.